Of all the materials used to build refrigerator boxes, none is better than strong fiberglass sheeting. Stainless steel looks nice but it is difficult to work with and thermally conductive. Plywood is popular but needs to be fiberglass coated and often ends up with a rough, amateur appearance. 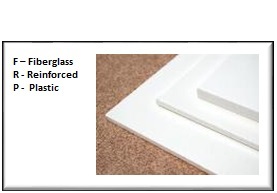 RPARTS has the answer: bright white, pultruded fiberglass sheets. Pultruding is a high-volume production method of making certain types of fiberglass products. In pultruding, continuous fiberglass strands are run through a resin bath and then fed into heated high-pressure dies. The result is a consistently optimized resin/glass ratio not attainable by any other method. Anyone familiar with fiberglass knows that an optimized resin/glass ratio means the highest strength attainable - often 3x higher than hand-laid glass. How do I build a box with it? You would use this sheet in the same way as you would plywood. Use a regular saw and carbon-tip blade to cut individual sheets to size. Lightly sand the edges, then apply a strip of fiberglass cloth and resin (polyester or epoxy) to the outside edges to hold it together. Once it is dry, use thickened and white pigmented resin to create 1" fillets on the inside corners. If you are reasonably careful with the filleting, the finished result will look like it was produced from a production mold. Once everything is set, you can paint the inside if you wish, but it is not necessary. Even unpainted, the FRP sheet is very bright and stain resistant. For more information, call RPARTS at (831) 600-7878 and ask to speak to our FRP specialist. RPARTS FRP sheets are available in 1/4" and 1/8" thickness. The 1/4" sheet is too stiff to bend much at all. The 1/8" material can be comfortably bent to a radius of about 18". Which thickness you should use in constructing your box depends on the size and shape. In most cases the 1/8" material has more than enough strength to rigidly support even the largest vertically hung holdover plate. Other Sizes? If you need a sheet of FRP with dimensions not listed below, please conatct us at (831) 600-7878. We can provide custom sizes to meet the needs of your project. Shipping Costs. Please call (831) 600-7878 to obtain an accurate quote for shipping. RPARTS may be able to provide a more cost-effective shipping alternative than the price shown at check out. 1/4" FRP Sheet 12" x 48"